Charlemagne (Charles the Great) was born in 742 AD to Bertrada of Laon (Bigfoot Bertha), and King Pepin the Short. Pepin was the first of the Carolingian dynasty to become king of the area we now call France. Very little is known about Charlemagne's childhood. However, we do known that he had a great aptitude for languages. He was known to converse in German, Latin, and Greek. Good fortune would strike the Carolingians in 751 AD, when the papacy(popes office) chose their family over the Merovingian family to lead the Franks(France). As a result, they became the most powerful family in all of Western Europe. Charlemagne was a huge man for his time, measuring 6 foot 4 inches. He towered over everyone. His hair was long and blond and he wore a long mustache, not the beard that most pictures depict. Charlemagne had a short thick neck with large beautiful eyes. He spoke in a high pitched voice, often stuttering. For entertainment Charlemagne loved to hunt and play violent games. He also loved to swim in his marble swimming pool at his Aachen palace in Germany. It was so large that it could accommodate 100 swimmers. He was also known to love music and women. Soon after Charlemagne became king he conquered the Lombards in northern Italy. Then just a short time later he destroyed the barbaric Saxons, and then the Bavarians. Each time he conquered a country he did his very best to turn the conquered people into Roman Catholics. Sometimes, after repeated failures at Christian conversion he killed them. At times this meant thousands of people died in one day. Before long, Charlemagne would reunited most of western Europe for the first time since the fall of the Roman Empire. When Pope Leo III was attacked and temporarily blinded by Roman nobles, Charlemagne was the one who came to his rescue. Angered at what had happened to the Pope he led his army into Italy and put down the rebels who had attacked the Pope. Charlemagne would be repaid on Christmas Day in 800 AD. In St. Peter's Church Pope Leo crowned Charlemagne the first Roman emperor in the West in over 300 years. The coronation marked a shift in power from the East to the West, and considered by many historians to be the birth of western European civilization. Charlemagne was very organized and he ran an efficient government. He used a system of semi-independent chiefs that were only responsible to him. At the same time he incorporated Roman ideas of a centralized government. He also used inspectors who traveled in pairs, who were called “missi dominici.” They reported directly to the king about what they had seen. Charlemagne organized his territories into manors or great domains. At the center of the domain was the masters house, church, granary, barn, stables, bakery, and rows of peasants cottages. Charlemagne took care of the greatest and smallest of details. He was also very accessible to the common citizen. However, his decisions were final, and he ruled over the church, state, and the lives of individuals. 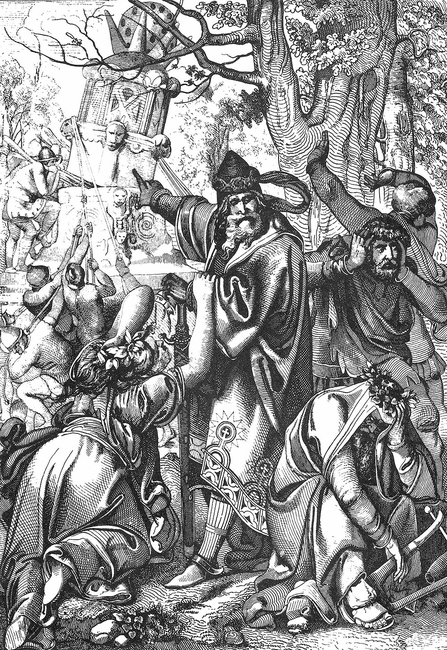 Charlemagne rewarded those that had fought for him on the battle field by granting them huge tracts of land. He appointed all of the churches bishops, and he supervised them as well as the lower clergy. He imposed the death penalty for breaking fast at Lent, and for eating meat on Fridays. Refusing to be baptized could also bring the death penalty.